Upper back pain is a frequent cause of disability and dysfunction. On Thousand Oaks the Duben Holistic Chiropractic Center meets many locals hoping to achieve a better understanding of their upper back pain condition and receive effective, long-lasting, drug-free, and non-invasive treatment. In addition to a sore, dull, achy, and stiff upper back, you may experience weakness, numbness, and tingling in one or both arms. This generally occurs if a nerve root in the upper back area is being compressed by something like a disc which has ruptured or is protruding out of its normal alignment due to acute or degenerative damage. There may be additional issues "upstream" or "downstream" from the upper back area related to your upper back pain, so additional symptoms can include headaches, jaw pain, ringing in the ears (often in the case of whiplash or concussions), core weakness, low back pain, flat or high arches, and other postural abnormalities. We use physical tests, personal history, diagnostic imaging, and innovative techniques like BrainSpan™ and Neuro-Emotional Technique to determine the factors contributing to your upper back pain diagnosis. Based on our findings and your goals and specific needs, we can alleviate your back pain naturally with techniques such as chiropractic adjustments, cold laser therapy, nutritional counseling, ergonomic training, and much more! 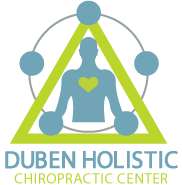 Call the Duben Holistic Chiropractic Center at (805) 494-1339 to schedule an appointment.